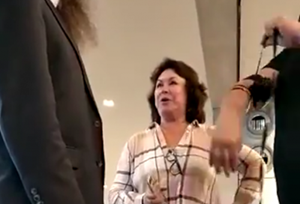 The May 30 cellphone video depicting a woman berating two Jewish men for performing a Jewish prayer at an airport would probably never have made news, let alone "gone viral," were it not for a confluence of details that make the entire episode so bizarre. It is peculiar that the location was Ben Gurion Airport in Israel, where Jews might believe they have a right to pray wherever they please. But the revelation that the perpetrator of the attack, Pnina Peri, is a professor of Israel studies made the scene incomprehensible for average viewers. For others it clarified everything. Most people would logically infer that a Jewish professor of Israel studies would be the last person to bully Jews for praying in the Jewish state. But don't be fooled by the discipline of "Israel studies" or even "Jewish studies." Academe is largely hostile to the state of Israel, and while some Israel studies programs are legitimate scholarly enterprises, others function as credentialed venues for spreading hostility to Israel in classrooms, books, and journals. Others still are formerly solid, unobjectionable programs newly infiltrated by BDS advocates. It is tempting to think of Israel studies as an ideological counter-weight to the universally anti-Israel Middle East studies establishment. In some cases, on some campuses, that may be the case, but "some programs," as Martin Kramer warns, "are as close as academe gets to a scam." It's a bait-and-switch affair in which donors are misled by the bait, or what Asaf Romirowsky calls "the core assumption that the presence of an Israeli scholar guarantees ideological balance in a department." The switch often comes when Middle East studies programs are involved in the selection of academics. Hiring Jewish academics who oppose Zionism and identify with the Palestinians adds an additional layer of credibility and helps dodge accusations of anti-Semitism. Sanford and Helen Diller learned this lesson the hard way when their philanthropic efforts to counter pro-Palestinian activism at the University of California, Berkeley backfired. They provided $5 million for a permanent visiting professorship from Israel in order to "get a real strong Jewish studies program in there," as Helen Diller put it. With the Dillers' money, the university hired Oren Yiftachel, a professor of geography from Ben Gurion University who believes Israel is an anti-democratic apartheid state. Pnina Peri is an "expert" at the Washington, D.C.-based Israel Institute and a visiting assistant professor of Israel Studies at the University of Maryland's Joseph and Alma Gildenhorn Institute for Israel Studies. What must the Gildenhorns think about how she is representing the institute bearing their names? In the many articles about Peri's bizarre outburst in Ben Gurion airport, she is referred to in virtually every one as "an expert in Multicultural studies." If so, her behavior casts a pall over her expertise and calls into question the value of her chosen field. The video shows Peri shouting and berating a Chabad rabbi as he helps a fellow traveler put on tefillin (the leather straps and boxes containing scripture used in Jewish morning prayer). As the men perform their unobtrusive prayer ritual, Peri screams at them, "Move because you are bothering me" and bellows "Why are you doing this here? There are people here." If the video had ended there, or if she had walked away, Peri might still be unknown. What she did made her infamous: she laughed for a very long time at the men, up-close and in their faces. It was a chilling performance that has to be seen to be believed. Most accounts say that she "laughs mockingly," but this is too mild. She derides the men in Hebrew, but her laugh transcends language. It is a taunting and cruel laugh, deliberate and prolonged. Nearly all the information available about Peri concern her airport antics. Aside from a book on multiculturalism published in Hebrew, she has almost no written record to examine. She signed a 2014 petition that attacks the Israeli press for refusing to address "the reality of occupation as the main determinant of Palestinian behavior." Depending on the Israel studies program, her signature might have been either a disqualifier or an important credential. Peri teaches a class advertised on the University of Maryland's website in a two-sentence description: "The prolonged conflict with the Palestinians and Araband [sic] states and Israeli occupation of the west bank for almost 50 years, had an impact on militarism, political life, centrality oft [sic] religious-secular relations, gender relations and the Israeli culture as a whole. We will examine the way art and cinema has [sic] dealt, with certain cultural issues and what sociology can contribute to our knowledge." I've never met a chair in any department who would approve such a shoddy class description. The one who did is Yoram Peri, Abraham S. and Jack Kay Chair in Israel Studies at UM. He is also director of the Joseph and Alma Gildenhorn Institute for Israel Studies at UM, as well as Pnina Peri's husband. 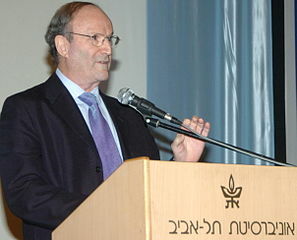 Yoram Peri once worked for Yitzhak Rabin, ran a Labor Party newspaper, and served as president of the New Israel Fund. Unlike his wife, he has enough of a record in articles and interviews to judge him a staunch critic of the Israeli military and of military officers-turned politicians. He is also a trafficker in some very irresponsible rhetoric. For example, in a 2006 article published when he was the head of the Herzog Institute for Media, Society, and Politics at Tel Aviv University, Peri made the absurd claim that Israel is "prepared to forego land on condition that we conduct ethnic cleansing in our smaller territory." The article regresses into amateur psychology: "even though Netanyahu managed, for a short while, to reign [sic] in Bibi, eventually Bibi re-surfaced and asserted his control over Netanyahu." So, Pnina Peri blames Israel for Palestinian terrorism, and her boss believes Israel is ethnically cleansing Palestinians — hardly the beliefs one would expect from the leaders in a department of Israel Studies. Anti-Israel Studies is more like it. Public reaction to Pnina Peri's demonstration of multicultural tolerance varied from outrage to confusion. There were many calls for the University of Maryland to fire her. The Coalition for Jewish Values wants her to undergo "diversity and tolerance training before she returns to the classroom." Others urge restraint, like the Pittsburgh Jewish Chronicle's editorial: "verbally assaulting a man for putting tefillin on in public is wrong, but without knowing Peri's motivations, it makes no sense to question her academic qualifications or to judge her on the basis of her religiosity, as many unfortunately did." This misses the point entirely. It might not make sense to question her academic qualifications were she a professor of mathematics, biology, or almost anything other than what she is — a professor of Israel studies who claims to be an expert in multiculturalism. The University of Maryland accepted Peri's tepid apology and her unbelievable claims that in the seconds before the video begins she was minding her own business when "two men arrived and started laying tefillin right on top of me," that the rabbi insulted her by invoking Hitler and wishing that her family had been killed in the Holocaust, and that the men called her "misogynist names." Not only do both men refute her claims; so does common sense. Nothing in the video suggests someone defending herself against ugly slurs and epithets. It shows an unhinged person punishing "the other" (to use the multiculturalist's jargon). Perhaps Pnina Peri believes, as her husband told the Guardian in 2004, that there are two kinds of Israelis: "The majority are [sic] western, secular, modern, future-oriented, while the settlers are fundamentalists who look back 2,000 years. They are xenophobic and anti-democratic." From this perspective, the two Jewish men donning tefillin in Ben Gurion Airport were practicing an ancient ritual, more than 2,000 years old. It was a public display of "fundamentalism" that needed to be corrected. Since she has escaped punishment, what next can we expect from Pnina Peri? Will she fade back into obscurity, contrite and better for having learned something about the inner demons that compel her atrocious behavior? Or was the Ben Gurion episode just a very public stop on a multicultural insult tour? Next up, Rome to rant at some nuns for praying on their rosaries ("superstitious fools"). Then to a Buddhist monastery to interrupt meditating monks ("look at you — just sitting there!"). And then to a Sharia nation to laugh uproariously as Muslims roll out prayer rugs and push their foreheads against the ground. Well, probably not that last one.